This topic contains 6 replies, has 4 voices, and was last updated by Allen 1 year, 1 month ago. This is my second try at starting a topic here…the site may be having some teething problems, but we’ll see. About ten years ago, I asked Carl Arendt for some help in coming up with a working micro layout plan from some sketches I had done. The idea was to have a winery railroad that was housed in a wine box. Carl insisted that a railroad must have a work plan, so he created a layout and a sequence of operations that made sense. We discussed and adjusted his sketch to work better with actual rail, and then I began building the layout. I complicated things by trying to automate various functions on the layout using a microprocessor, servos, and sensors. I managed to automate individual functions, but my effort to bring all those pieces together into a single program ran into difficulty. About that time I found that other things had priority, so the railroad was shelved. Now I have time and I would like to revive it – I still have all that was done – but I need some of this micro layout community to give me a push and encouragement to get me back into gear. With this all new carendt.com, I’m hoping that micro layout interest will come together again. Did you scratch build the turnouts? What plan or method did you follow? Allen, I did not scratchbuild the turnouts; they were built by a guy in Germany whose name I no longer have. I do have some original Egger-Bahn turnouts that I’m not using if you are interested. If I were starting now, I would use an Arduino, but this was some time ago and I used a Picaxe microprocessor system that was designed so that school kids could learn to program and use servos, etc. The program is written in BASIC that has some extensions such as SERVO commands, then compiled and downloaded to the microprocessor. Since I was proficient in BASIC, this was a good choice for me. This system also has an IR IN command that could detect button pushes from a Sony TV Remote Control, eliminating the need to build a control panel. A “load swapper” that is hidden in the loco shed. It detects an incoming flat car (magnet under car trips reed switch) and cuts power to ensure that the car parks in the right spot. As the car is backing into the shead, the swapper spears an incoming load. Under command, it then rotates to remove that load and place another on the flat car so that when the loco pulls the car out of the shed, a new load is on the car. For example, the incoming load can be a barrel of wine from the cave/cellar area at the top left in the picture and the outgoing load can be a case of wine bottles. This simulates moving the wine to the building for bottling, then shipping the bottled wine. 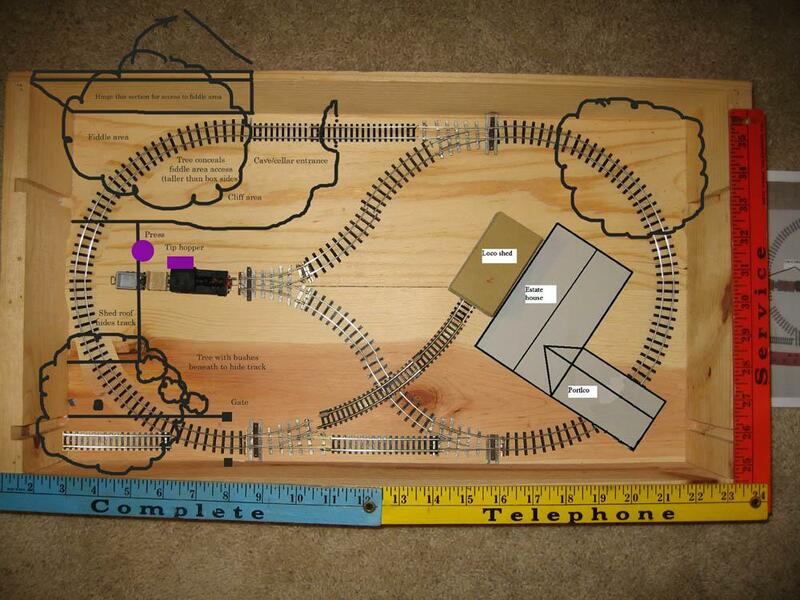 A small turntable at the X intersection below the center of the layout, plus servos to throw each turnout, with routing for each movement on the layout. A “dumper” at the point marked “tip hopper” that would tip a little v-hopper car coming in from the vineyard to dump the grapes into a bin for crushing. All these pieces of the puzzle worked individually, but I only made one brief attempt to reconcile all the parts into one program. My long-term intention, had I managed to get all this working, was to write an article for possible publication so that others could benefit from my efforts. Certainly using $2 servos to throw turnouts is a good cost savings over using $15 turnout machines, and that would be an easy system to program to operate individual turnouts – and much easier wiring. That is some pretty neat automation if you ask me. Using servos to swap loads via a “spear load” is pure genius! I believe that you can pick up where you left off easier than you think. Since you are obviously a tinkerer you already have a collection of small electronics and would only need to get the Arduino Uno off Amazon for $20. The handy thing about Arduino is that the IDE comes with gobs of built-in libraries for controlling those RC servos (and lots of other stuff) so instead of “reinventing the wheel” with programming code you can focus on translating your overall automation plan into logical sequences.